Today is all about the BLING-nail bling and neck bling. If you have never put crystal on your nails and want to (either for Halloween or just 'cause) check out this tutorial on how to apply crystals on your manicure from the book Glam Nail Studio: Tips to Create Salon Perfect Nails and then scroll down to see how to make a looped chain necklace with a whole lotta Prima Bead Bling elements. Click on these pages from Glam Nail Studio: Tips to Create Salon Perfect Nails to enlarge and read how to apply clusters of crystals on your nails to make a sparkly manicure. Part two: The Halloween bow, skull and wind-up key necklace. Now for all of you who like to make jewelry, I whipped up this fun sparkly necklace with some Prima chain, a super-sized clasp, a sparkly bow and from my stash a skull and wind-up key. Draw one end of the loop of chain through the large link on the toggle clasp and then pull the other end through the loop of chain. The far end of the loop will link to the toggle clasp when you wrap it around your neck. Link the Prima Bead Bow charm onto the large link of the toggle clasp. Link charms on varying lengths of chain and then onto the bottom loop of the bow charm. Pretty easy, eh? And easy to swap out the charms dangling from the bow when you feel like switching things up...stay tuned as I will be adding some Christmas charms onto this base necklace after the fall holidays! 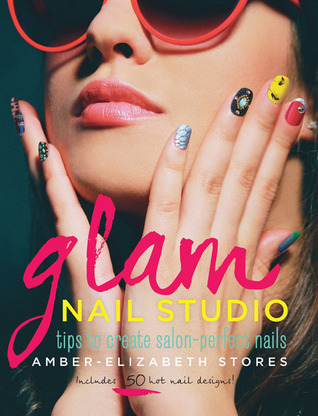 Celebrity manicurist Amber Elizabeth Stores brings the salon straight to your living room in this graphic, information-packed guidebook, working from the inside out, Stores starts with research-supported advice on which foods to eat and products to use for optimal nail health. Next up she gives a basic introduction to the kinds of equipment you’ll want to have on hand, explaining how and why each tool is used. She’ll then delve into the vast world of nail polishes, illuminating the differences between base coats, ridge fillers, strengtheners, sealers, and more. Included in her polish tips is a unique guide to selecting the perfect colors based on your skin tone, style, and the season. Polishes are followed by a chapter on nail shapes—what they “say” and how to attain them. A chapter on the “Not-So-Basics” takes the salon experience to the next level, with tips for electric manicures, hot oil manicures, paraffin waxes, and more. 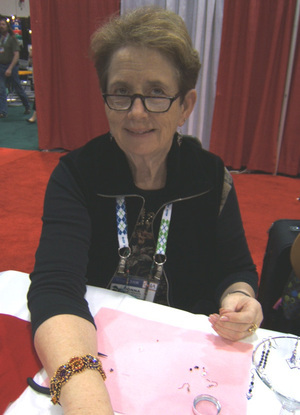 The “Queen of Shellac” goes on to share her top secret tips for acrylics, gels, and myriad effects (marbling, dotting, fading color, glitter dust, to name a few) in the second to last chapter. The book’s grand finale is a collection of stunning, fashionable photography showing how artful and fashionable nails can be—and inspiring an infinite array of ideas in the reader. New York based Amber Elizabeth Stores is a fashion force to be reckoned with, nail file in hand! The “Queen of Shellac” is world-renowned for her impeccable manicures and pedicures, specializing in realistic extensions, intricate nail art, acrylic treatments, rhinestone and glitter application, airbrush effects, and more. Stores has been on call for her artistic expression by the likes of Jason Wu, Alexander Wang, Betsy Johnson, Diesel, GANT, Vena Cava, Italian Vogue, BlackBook, Marie Claire, POP, and Surface. Her celebrity client list includes Florence Welch, Ashley Green, and Nicky Minaj. "Join Swarovski Ambassador and Designing Diva Margot Potter on January 31st at the Create Your Style Design Challenge and Event. It's an 8-hour intensive design challenge, class and contest with fabulous prizes, sensational swag, and sparkling inspiration all leading to a champagne reception and award ceremony! Are you ready to roll up your sleeves and show us what you've got? Click here to find out more about the show and the event!" Don't miss the artist Interview with Traci Bunkers author of The Art Journal Workshop and Print & Stamp Lab! Cyndi plays around with inkjet printer silk! Learn how to make an origami bunny Easter garland. Interested in knitting or crocheting for charity? Tammy invites you to join a new group of charity yarn crafters. Carmi has a cross over link so you can enter to win a kumihimo starter kit! Aileen shows you how she created magic by turning an ordinary paper mache torso into a lamp that looks like patinated copper! Taking the Bull by the Horns: Making Your Portfolio Work for You. 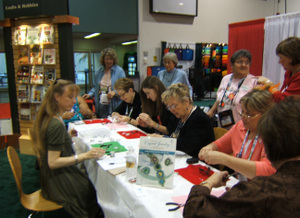 So the big industry trade show known as CHA (Craft and Hobby Association) is this weekend and there is so much going on! If you are in the trade and will be attending the big show down at the Los Angeles Convention Center please come by the Craftside (also known as Quayside Publishing Group and Walter Foster Publishing) booth #323 for all these amazing author make and takes. Click on the image to enlarge and print out so you can plan all your fun. Or just come by the booth #323 and grab a schedule. And if you drop your name into the hat, you will be entered to win free books! Also, do you make handbags and want to get them some exposure? Check out this ABC News video that includes information and tips on entering the 5th Annual Independent Handbag Awards (totally free!) with Emily Blumenthal, author of the upcoming book Handbag Designer 101. Pop on over to The Handbag Designer 101 website for all the entry info. Give your photos a delightful old-fashioned look, while still keeping the color! See how to make a flattened coil and recycled sweater bound journal inspired by the book Creative Bloom. The current make-it-over craft challenge is all about making Valentine card and treat holders. Do you have a favorite to share? Aileen has a new product announcement and giveaway! Carmi uses some free digital files to create new cards. Tammy's done some crafty Valentine's shopping, wee! The road to success is not an easy path, but the journey is certainly worth it. Stitch the free Road to Success Sampler as a colorful reminder. Have you ever crafted by camplight? Come on a crafting adventure with Eileen. Learn how to make custom handcrafted ear wires in this week's video on demand for JTV's Jewel School! And last but not least, another FABULOUS book and fabric giveaway over at Sew Retro along with a Q & A with Anna Maria Horner. 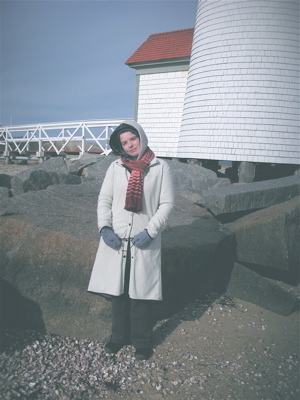 I got on the list for her newsletter and the most recent one held this cool picture of Laura on Nantucket. I got all warm and fuzzy inside 'cause I'm from New England and I just love seeing pictures from back there. Everything has such a rich texture and earthy feel. In her newsletter there were announcements of new items available on her website Just Let Me Bead and in celebration of official "Mom and Pop Business Appreciation Day" on March 29th they are offering a 10% off special on all orders placed between now and March 29th. While it won't show on your confirmation, they will automatically apply it from their end before charging through your order. 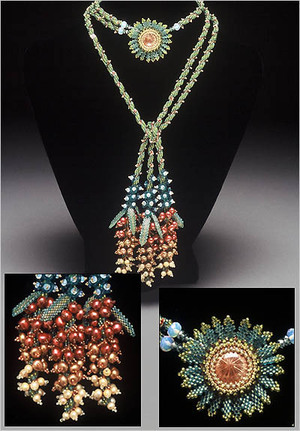 And in addition to teaching two workshops, The Dodecahedron Pendant Workshop and The Keshi Pearl Necklace Workshop, Laura will have a booth at Bead Expo March 27-30 in Portland, Oregon. June, including my "Pokeweed Berry Lariat" two-day workshop. Picture above. 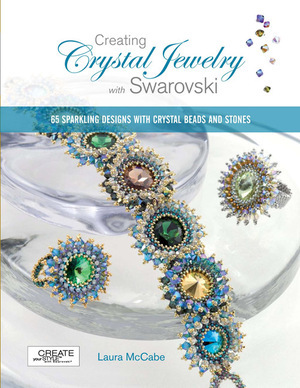 To see some more cool jewelry made with Swarovski Crystals simply click on the link "Swarovski" on the top right area of this blog under categories. So if you need more bling or want to learn how to work with the bling, you can pick up a book, scroll through a website or travel the globe. How ever you do it-have a sparkle-tastic good time! Here is another look inside CHA. 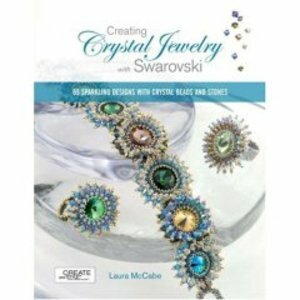 This time it is the Make and Take to give crafters a chance to work with Swarovski beads. We made beautiful earrings and crafters learned how to make wrapped loops. The earrings were inspired by design patterns that Laura McCabe teaches in the CPi Book Creating Crystal Jewelry with Swarovski. Check this out, one of our crafters, Donna, was sporting a project she made from the book and isn't it spectacular! She customized it by using a different color pallet.